Soups are soothing for Winter and also when having cold. This is simple and quick. Carrot, Beans & Cabbage - ﻿1 cup chopped thinly. Ginger & Garlic - 1 no. chopped or mashed. In a wide vessel, add vegetables, ginger and garlic, salt with water. Boil well till veggie is half cooked. Add pepper and soya sauce, mix well. This recipe is going to Healing Food Ginger Garlic at my space started by Siri. 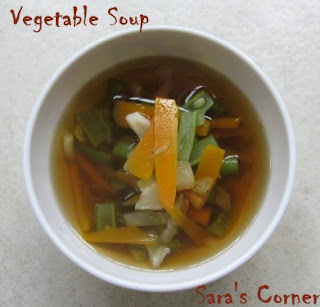 Soup looks very pleasing and clear,loved it sara! simple n perfect for my soar throat.. Simply superb,prefect soup fpr chilled weather.. The soup looks beautiful, clear and colourful. How wonderful to find this vegetable soup here today when the weather has turned from warming to icey cold. Brrrr. And the indoor heating is drying. And a soup with cabbage, ginger, and garlic, is so good at this very time of year, yes? Veg clear soup is so comforting! Omg, soup makes me hungry..Soo tempting! Healthy soup..perfect for this season!